Some of the points we keep in mind when selecting a Five Star Winner are whether exhibitors attract a large number of attendees to their table, stay until the very end of a show, effectively communicate their product’s message and engage with attendees. Five Star Winners receives a framed certificate, an e-mail about their award sent to all of our vendors, a posting on our website with a link to their company’s website, and a blog article spotlighting their exceptional performance marketing their lab products and life science products. We value salespeople who educate their customers about their products because it usually results in better sales success, and customers trust these salespeople to deliver better after-sales service. It’s important for salespeople to let customers know how their products will relate to the attendees’ research. This sort of knowledge can help researchers connect an exhibitor’s product with what’s missing in their research process. An educational approach towards lab products and services often results in more sales than a purely selling approach, and our Five Star Winners are great at increasing attendees’ knowledge of their company’s products and services. Friendly and approachable, Five star reps make the extra effort to connect with new people at every event they attend. A great sales rep gets to know their customers, and asks probing questions to determine their current needs, and anticipate future needs. These reps also know a lot about the industry, understanding not just their clients’ needs, but keeping up the market as a whole. (See Science Market Update). They discover which products are in demand, what the market trends are, and know who their competitors are and how their offerings differ. Great sales reps are also fantastic communicators who engage customers by giving them their full attention, making eye contact, and showing interest in their research and product needs. Finally, our Five Star Winners follow up with customers and realize that our trade shows are the beginning of a longer-going communication. These sales people are tenacious and understand their customers’ buying cycle. Five Star Winners can tell their supervisors, colleagues and friends about their outstanding salesmanship at our events and let them know that they have been recognized for their work. The more times an exhibitor wins a Five Star Program Award at our life science marketing events, the better chance they have of being selected as the overall Five Star Winners at the end of the year. The overall winner selected at the end of the year will receive a bigger prize, which we will announce on our website and blog. Biotechnology Calendar, Inc. is happy to announce the Five Star Winners of our Southwest life science marketing events so far this year. 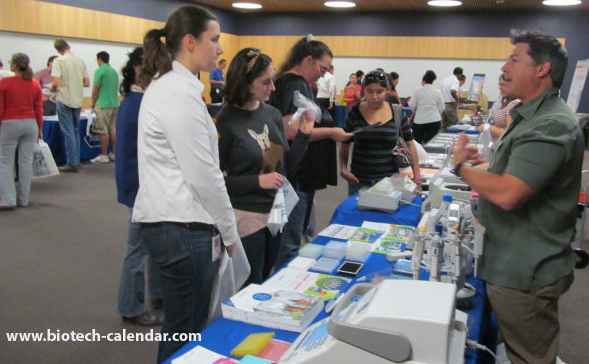 Click here to see a full list of our 2013 Southwest region life science marketing events. Congratulations to the winners for your brilliant marketing and engaging salesmanship of lab products and life science products this year!